Growing up in Chicago, “going to the beach” meant driving to the nearest shore of Lake Michigan on a hot day. We got passes for a local park district-run park a few summers, when my sisters and I were older, preferring the sand to the hot concrete of the local pool, the fresh water to the chlorinated blue. But the water was shallow unless you swam way out, and the only waves that ever presented themselves came from the wake of a passing boat. Lake Michigan is huge, and cold, and the beaches are lovely and require lifeguards, so I will defend tooth and nail these experiences as “days at the beach.” But I get it that the ocean is different. In 2003, my maternal grandparents celebrated their fiftieth wedding anniversary. Instead of throwing a big party, they took our extended family (eight people at the time) on a week’s vacation to the Outer Banks, off the coast of North Carolina. We rented a house, and spent our days at the beach, took turns cooking, went out for dinner one night, bought t-shirts and ice cream on the last night. The week was so marvelous, we’ve made a tradition out of it. We rent different houses each year, as our needs for bedrooms keep increasing. First I got married, then had a baby, then Taylor brought Nathaniel, then Whitney married Mike, our second daughter was born, and Whitney had her own two. We have learned things about The Beach. Learned what sort of day brings the strongest currents and the worst risk of sunburn; learned that warm ocean water is to be treasured, but periodically encourages jelly fish to swarm the shore. We have gotten better each year at playing in the waves; maximizing control of the rented kayak, minimizing the number of times the waves crash us into the shell-laced sand. Having children now accompany us has changed the dynamic of the trip in entirely unsubtle ways. We’re all up earlier and turn in earlier, too. 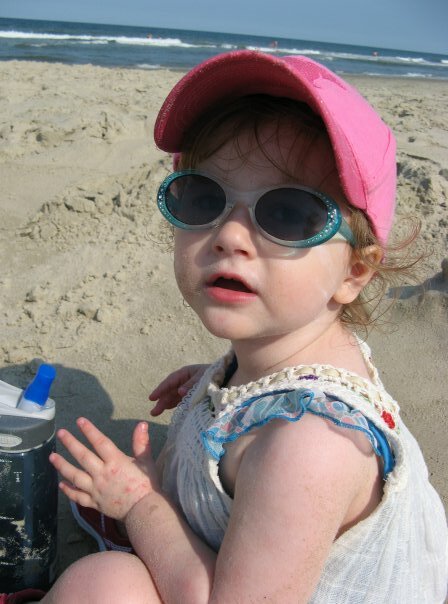 We do a lot more playing in the sand, and we’re much more responsible about sunscreen. But the biggest difference, for a number of years, was that we didn’t swim in the ocean all that much. My girls were scared of it. The crashing waves were loud and intimidating; they tasted the salt in the water, the temperatures were too cold. They wanted nothing to do with The Atlantic. 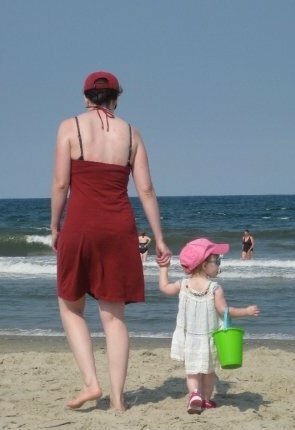 One year, we convinced them to do some wading, and as my younger daughter felt the sand slipping out from under her feet, she panicked. My older daughter got knocked over and cried when her eyes burned and her nose filled. After that, they thought the grown-ups were nuts for even suggesting they play in this massive, terrifying body of water. This year, the girls are seven and four. They are not strong swimmers, so they wear life jackets in the water, and cling to their father and me. Together, we ride the waves. A few times, we get water in our eyes and noses, but I teach them to spit, and to blink until the salt runs out. I practice turning their backs to the waves, so that the water does not splash directly in their faces. We giggle and relax and taunt the waves: I thought you were going to be a big one! We gasp in anticipation and mock horror: Oh! Get ready! It’s huge! I am astounded this year, watching the confidence and joy they exude. They skip and hold hands and call to each other. They race around the water’s edge. They point out birds and sea glass, examine “mermaid’s purses” and the shells of horseshoe crabs with my mother. They are so beautiful in their little bathing suits, with their sandy, salty hair and their baby tans. They are so fun. In the middle of the afternoon, we both get a face full of water. She sputters, and starts to cry. She wants to get out, maybe. But then she stops, holds her nostrils closed one at a time and exhales through her nose. She spits, wipes her eyes. She smiles, and turns to await the next wave. How did this happen? When did they become so confident? My little one worries a bit when we see a jellyfish, and I tell her: You don’t have to be afraid. I’ve got you. It is, I think, the only time I’ve ever felt like God. Do not fear, for I am with you… I will strengthen you, I will help you.